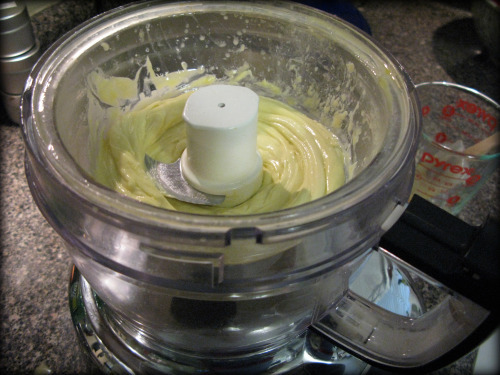 Step 1 In a blender or the smallest bowl of your food processor, burr the egg yolk and salt. Slowly drip in the oil. Please look at the stream of oil in the picture for my definition of slow. It is very important to drip-drop the oil into the egg yolk at the beginning, making sure the yolk and the oil have thoroughly combined before adding more oil. Once you start to see the yolk thickening, you can add the oil at a slightly faster rate. Step 2 Once all the oil is gone, add the lemon juice. Now the mayo is done! It should be thick, slightly yellow and incredibly yummy. appy Cinco de Mayo-nnaise day! Instead of posting margaritas and nacho recipes (although, we are working on the latter), we decided to discuss mayonnaise; how it’s made and what you can do with it. It is NOT hard and does NOT take long. Please don’t be afraid. Store bought mayonnaise is quite tasty, but unfortunately, we haven’t EVER found a brand that didn’t contain canola or soybean oil. So we like to make our own. We either use bacon fat (click here for the recipe) or the only other fat that’s healthy and affordable enough to use at 1/2 cup intervals: avocado oil. Mayonnaise is an emulsion of tiny drops of some type of liquid fat into egg yolk, along with a bit of acid and some salt. Yes, the yolk is technically raw. It does get slightly cooked by the acid you add, but it is important that you source eggs that don’t have any cracks, are from pasture grazing chickens and are from a source you trust, preferably a local farm. The basic recipe below yields about 1 cup of mayonnaise and keeps in the fridge for about a week.